What do you mean with staggering ? Having a slightly different length (dual system with or without x or h ) from the collector end the the muffler inlet. Most bodies i deal with I can get these lengths from 3 to 6 inches different, even 2 inches makes a difference on a really bad droning system. Thanks Craig, I see some logic to that approach. Sadly i will not be able to do that anymore, unless I would make one exhaust tip longer than the other. Aside that I have a feeling that something in the exhaust tubes is banging right below the floor pan of the rear compartment in my vette. It then acts as a sort of speaker box. Ah yes a Vette is not going to be so easy for room! Fix the area where the tube is banging 1st. Do you have any room anywhere to add a side branch/helmholtz resonator, its simply a capped length of tube added to the system, this is another effective drone killer, very cheap and easy to do, there are calculations that can be done (use the cool spreadsheet provided earlier in the thread) to get the length/volume right or simply add a section and if the drone does not go away fully you can experiment and either add length or reduce length until the drone stops. That's good to know. I had no idea 2-6" would make enough difference. 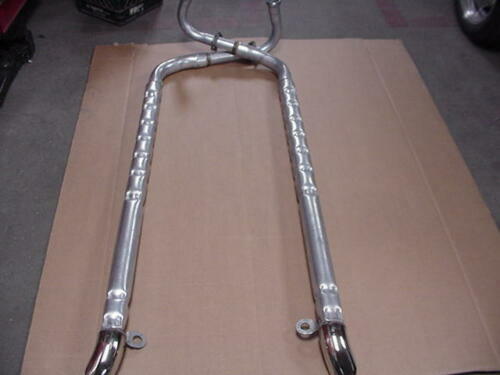 If I recall, my SN95 mustang OE exhaust had a slightly different position of the mufflers, and the muffler cases may have been a slightly different size. It's been 20 years so I may be wrong. This brings up an interesting question... often manufacturers offer a 14" and 18" case muffler in the same series. I wonder if using one of each would be effective in killing drone in applications where there is no room to move the muffler?. Depending on the design of the muffler, the flow difference between a 14" and 18" case probably wouldn't be that great. 2 different mufflers no doubt would help! A freind of mine bought a 71 XY Falcon GT replica some years back, it had a 351C dual 2.5" exhaust with H pipe and had 2 completely different mufflers (im sure thus was simply done to replace a holey muffler to sell it, the whole car looked good but was rough when looked at closely!) , one was a perforated straight thru type and one a chambered type! It sounded ok and did not drone at all, it stayed on the car for about 3 more years before rusting out! Wow... Nice XLS... Where'd you get that? I am a habitual spreadsheeter with a general interest in NA IC performance and a particular interest in understanding intake and exhaust systems phenomena. PM me a email if you would like a copy of the drone sheet. It is nothing special, mostly based on readily available equations from Wikipedia, the various automotive performance forums and a couple possibly erroneous conclusions of my own regarding the effects of the lower odd harmonics in drone based on reviewing a single spectrum analysis. You should probably note, I have never actually built a drone suppression system. I tried emailing without success. This is the base sheet I copied into my work book. It has several of the equations listed out to the right as I worked through them for reference. You don’t need them. At the bottom of the sheet are a couple verification equations to confirm everything was working property (Arriving at the same answer using separate methods). You don’t need them either. The sheet is protected to prevent changing the work cells, but there is no password if you wish to change it around to clean it up to left overs. If you have any question as to why I did something, just ask. I hope you find it useful. It is in 2016 Excel format. There are no macros associated with it. Can you explain that spreadsheet a bit ? I've start to reply twice now. Your question is somewhat vague and rather than write a short dissertation and still not answer your question, I wonder if I could request more detail as to what you want to know. How does a 1/4 wave side branch resonator work? It provides a return frequency that is 180 degrees out of phase to the drone frequency and so has sound pressure canceling properties within a limited range match. It is driven by the base frequency so is passive in operation. What is the propose of the equations on the far right side of the sheet? General calculations for use in setting up the main equations on the left side of the sheet and to provide center line distance of a curved pipe for building a resonator. The SOS calculation is if you have a better idea of the temperature of the gases at the location you plan to place the resonator. What is the propose of the Helmholtz equations? It allows the creation of a resonator that can be smaller in some dimension(s) for fitment needs. What are the single open end resonate tube equations for? I just used them for confirmation of the frequency length equations above and they reminded me to compensate for tube end effect. Re SOS calculations, many people don't realize that the average gas temperature in a sealed-end exhaust system pipe is closer to ambient than to EGT. Yes there is really no flow to refresh dissipated heat. Just gas constantly compressing and expanding. I was one of them. Thank you. Great thread! Will follow with interest. Am building 2-1/2" dual exhaust system having no traditional mufflers. Decided to revisit the late 1960s chambered exhaust systems and see what can be done today along those lines with addition of side branch/helmholtz resonators (nodes). What I need to figure out/quantify is where to place (and at what interval to space) both the crimped areas for the chambered sections as well as the side branch/helmholtz resonators. For instance...... If running an H-type balance/crossover pipe connecting left and right banks...... Would it be a good idea to align side branch/helmholtz resonator connections with ends of balance pipes at their points of connection to left and right banks? Or purposely stagger them elsewhere? Car is a mostly street driven '57 Chevy sedan. So have some space available under car. Not as tight as Mustangs, 'Vettes, etc. Any ideas along these lines greatly appreciated. Those chambered pipes (Walker?) were a factory option on sixties GM muscle cars. They were crazy-loud; I couldn't believe they could be OEM- legal! They also looked pretty restrictive, but these current re-pops have apparently taken advantage of later research re backpressure vs. HP. You read my mind. That is one of the companies I am considering sourcing my chambered exhaust sections from. I have visited their website and their methodology looks to be well thought out. Basic plan for my 292 inline 6 powered '57 Chevy sedan is to run 2-1/2" duals and incorporate chambered exhaust sections for the straight runs from transmission crossmember (I am adding one to help support the T-85N OD Ford truck transmission) back to kickup over rear axle and (if there is room) in the straight runs of tailpipes between rear axle and rear bumper, as well. As you noted, the chambered sections are constructed like long glass pack or steel pack mufflers (full sized 2-1/2" dia. louvered inner flow tubes encased in 3-1/2" dia. outer casing). Only instead of containing packing, the annular space between inner flow tube and outer casing is void and the crimps in outer casing are supposed to form the individual chambers for sound attenuation. If I were good enough at math to work out the design as per Stoke's law of sound attenuation, I would apply it to placement and spacing of the chambers. That's a bit advanced for me though (old guy with pocket calculator here)...... I'm better at turning wrenches, fitting pipe and welding. So I'll ask the more highly educated here how best to do this by way of practical application. ...... In the straight runs of tailpipes between rear axle and rear bumper. Will also add an H-type balance (crossover) tube connecting right and left banks upstream of mufflers (chambered sections in this case) and a pair of side branch/helmholtz resonators at the same point of connection as H-pipe (only on outboard side of main pipe run). If there is room under car, will add a 2nd pair farther downstream, as well.